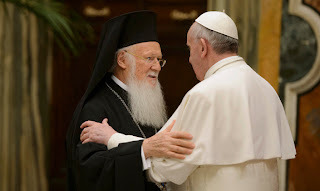 Pope Francis and Ecumenical Patriarch Bartholomew continue the 50-year legacy of Catholic-Orthodox dialogue begun by Paul VI and Athenagoras. Pope Francis met with fraternal delegates of the Orthodox Churches, other Christian churches, and world religions on Wednesday, March 20. These representatives had come to Rome for Francis’ inauguration Mass on Tuesday. Prior to the Wednesday’s meeting, the Holy Father and the Ecumenical Patriarch of Constantinople had a 20-minute private conversation. Father Lombardi, director of the Holy See Press Office, said the discussion was both “beautiful and intense.” Over the past week, Francis and Bartholomew have set a foundation for further cooperation and dialogue by reaffirming their joint desire to cooperate as Christian brothers in promoting the stewardship of God’s creation, helping the poor and suffering, and witnessing to life in Christ.